The four towns of Bourne, Falmouth, Mashpee, and Sandwich, collectively, own the Upper Cape Regional Transfer Station, which is located, per a consent decree, on Joint Base Cape Cod. Historically, the transfer station was used by the towns for the collection, storage, and shipment of municipal solid waste. In 2014, each town made other arrangements, such that the transfer station was no longer in use after January 1, 2015, until, in 2016, a proposal was made to lease the transfer station to a private party in order to generate some revenue for the towns. There is a railroad track that runs from the transfer station to the North Falmouth Secondary Line. 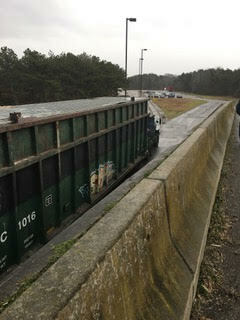 That enables the user of the transfer station to ship materials off the Cape by rail. Without that line, materials could still be shipped by truck. The Cape Cod Commission, in its April 2017 Shining Sea Bikeway Extension Feasibility Study, identified three options for construction of the Bourne Rail Trail, estimating that the least expensive option, by far, would be a “rail to trail” approach, whereby the North Falmouth Secondary Line would be converted to the trail. If the lessee of the transfer station were to use the rail line, that would preclude the rail to trail option, prior to any further study of the best approach to creating the Bourne Rail Trail. 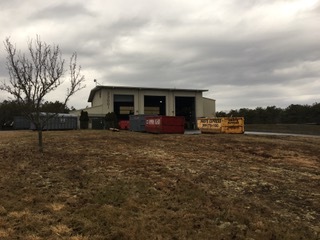 The Friends of the Bourne Rail Trail therefore objected to the lease of the transfer station to a private party, unless that lease did not include any right to ship materials from the transfer station by rail. The Friends interest was in ensuring that all of the options for creation of the Bourne Rail Trail remain viable. This argument was particularly persuasive given that the income derived by the taxpayers from the lease of the transfer station would be relatively insignificant compared to the monetary cost to the taxpayers of maintaining the rail line and the nonmonetary cost of likely long-term delay in creation of the Bourne Rail Trail. The Bourne Board of Selectmen considered the issue carefully and voted to recommend to their representative on the Board of Managers that has responsibility for the transfer station, that he oppose the lease of the transfer station to a private party. A concerted effort was made to convince the other three towns to oppose the lease, if for no other reason, to be “good neighbors” to Bourne. After significant debate, in August, 2017, the Board of Managers voted 3-1, with Bourne in opposition, to approve a lease of the transfer station to Cavossa Disposal Corporation. The lease is for a term expiring December 31, 2022, subject to an option to extend the term for two years until December 31, 2025. In response to the objections of the town of Bourne and the Friends of the Bourne Rail Trail, a provision was included in the lease that in effect reserves the right at any time to eliminate Cavossa’s right to ship materials from the transfer station by rail. Cavossa, now in possession of the transfer station, has begun limited shipping of materials by rail from the transfer station. While the termination right in the lease preserves the rail to trail option for creation of the Bourne Rail Trail, the Friends of the Bourne Rail Trail continue to question to value of the Cavossa lease, given that the revenue to the taxpayers from the lease is only approximately $20,000 per town per year, while the Massachusetts Department of Transportation appears to have committed roughly $3 million to improvements to the North Falmouth Line. Those improvements essentially mean that taxpayer money will be used to provide a rail line that is used only by two for-profit parties, Cape Cod Central Railroad, Inc. and Cavossa Disposal Corporation. Presumably, the rail to trail option will continue to be explored and the objections to removal of the North Falmouth Secondary Line addressed. The issues are: the use by that line of the private parties described above; the possibility that some time in the distant future the four towns may decide to again use the transfer station in connection with municipal solid waste disposal; and the inclusion of the rail line by the U.S. Department of Defense as part of the Strategic Rail Corridor Network (STRACNET) Connector Line critical to move essential military equipment to ports around the country. The Friends of the Bourne Rail Trail believe that the interest in maintaining private party contracts with limited benefit to the taxpayers is far outweighed by the demonstrable significant benefits to the public of the Bourne Rail Trail; that any resumption of use of the transfer station by the towns would be many years down the road and the likelihood extremely slim given capacity of the Bourne landfill and changes in technology for the handling of municipal solid waste; and, finally, that, given that the bulk of the railroad line on Joint Base Cape Cod is in significant disrepair and in many sections nonexistent, in the unlikely event of a need for deployment of equipment from Joint Base Cape Cod, that movement would require speed and be accomplished by truck and airplane.